To help staff and students quickly find useful code snippets in VB.NET, Python or pseudocode (for GCSE Computer Science with OCR, AQA, Edexcel or Eduqas) I’ve been putting together this website. 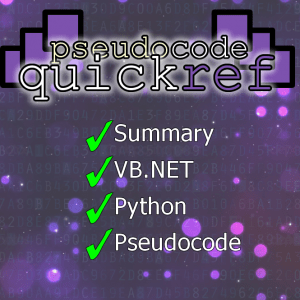 It aims to be a pseudocode, Python, VB.NET quick reference guide so you can quickly find definitions of key terms, a simple explanation of how key programming concepts work alongside code snippets that you can adapt and re-use as you learn. VB.NET and Python are both programming languages designed to be understood and followed by computers. Pseudocode is not a programming language: it’s written to be understood by humans so that they can turn it into any programming language. In the UK, each exam board has published a document saying how they’ll use pseudocode to describe algorithms in their exams. The whole idea of syntax (a set of rules) for pseudocode is silly – it’s not designed to be a programming language that is run by a computer. With this in mind, all exam boards state that you don’t have to follow the syntax for ‘their’ version of pseudocode when you write out your own algorithms, but you should be able to understand their version of pseudocode when reading an algorithm in an exam. The idea is to give a really quick at-a-glance guide to explain some of the key concepts of programming that you need for GCSE Computer Science, alongside code snippets in Python and / or VB.NET as well as pseudocode for whichever exam board your school is using. This searchable reference guide is designed for teachers and students preparing either for a Non-Examined-Assessment (NEA) or revising for a theory exam. Students are not allowed to access the Internet and are not allowed to have access to code snippets matched to pseudocode like this during their actual NEA sessions. This resource is designed for students to access for support outside of those NEA sessions. Variables and Constants: learn how to store and access data of different types. String manipulation: learn how to edit, join and process data stored as text. Builtin functions: learn how to generate random numbers and other useful features. Input and Output: learn how to read data into your programs and send it out to the user. Arrays: learn how to store and access lots of data all stored in one variable. Conditional logic: learn how to let your programs make decisions. Repetition: learn how to control the flow of your programs using loops. Functions / Procedures: learn how to decompose your programs into re-usable blocks. I hope they’re useful. Let me know if you spot a mistake or think of something that’s missing that you’d find useful. Create.withcode.uk is designed to allow anyone to write, run, debug and share python code that runs in your browser. It’s designed primarily for use in schools to allow teachers to quickly share code with students that they can adapt, debug and use. Here’s an example python program that asks you for your name then says hello. 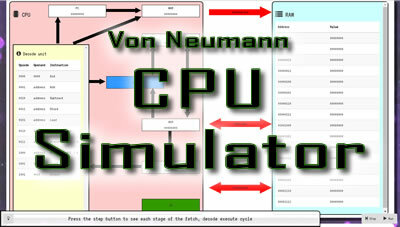 Press Ctrl + Enter (or click on the green plus at the bottom of the code screen) to run the code. To make it even easier to embed your python projects into your blog or website, I’ve shared a plugin for wordpress that lets you quickly add python code using a wordpress shortcode. Press Ctrl + S or click on the share button. This make your code available to anyone with the link. This will display the python source code in your blog page or post. People viewing your website will be able to view, run and debug your code. Click here to download the wordpress plugin or to find out more. Like create.withcode.uk, the wordpress plugin is free and open source.